Portugal’s first encounter in Group B saw a simply thrilling encounter with Spain, a topsy-turvy game in which star man Cristiano Ronaldo rescued a point for his side with a stunning last-gasp free kick. That result essentially means that the near neighbours will be gunning to outscore each other in the remaining matches, with Morocco up next for the Portuguese and La Roja to take on Iran. While Lionel Messi struggled during Argentina’s disappointing 1-1 draw with Iceland, Ronaldo used the world stage as his chance to shine, drawing joint-second on the list of all-time international goal scorers with his hat-trick, only Ali Daei having fired in more during his spell for Iran between 1993 and 2006. Meanwhile Morocco enjoyed more possession and created more chances in their opening match with Iran, however succumbed to a 1-0 defeat thanks to an Aziz Bouhaddouz own-goal after having conceded a sloppy free-kick. Such a poor performance from a team normally sound defensively could prompt Renard to shuffle his pack for the forthcoming fixture with Portugal, however it will be a tough ask to get anything from their well-organised opponent, especially with Ronaldo spearheading the attack. This will be just the second time Portugal and Morocco have faced each other, the last time at the World Cup back in 1986. On that occasion, the Lions of the Atlas emerged as 3-1 winners to finish top of the group and knock Portugal out, however a win for Morocco this time around looks unlikely indeed. 888sport offer 3/5 on a Portugal victory, while you can get 7/5 on Fernando Santos’ men to win to nil with Karamba. It seems as though Morocco won’t have enough in their locker to bring about a victory on this occasion, but their loss to Iran did end an 18-match unbeaten streak. Therefore, if you fancy Morocco to break the deadlock at some point, Sportnation’s odds on a Portugal win and both teams to score are 11/4. After leading his unfancied side to victory in Euro 2016, it certainly seems like Ronaldo is on a mission once again, his superhuman qualities on display throughout the match with Spain. Karamba are offering a whole host of bets on Portugal’s star man, all of which are worth your time considering he surprised even his most staunch of supporters with just how influential he was on the result with Spain. 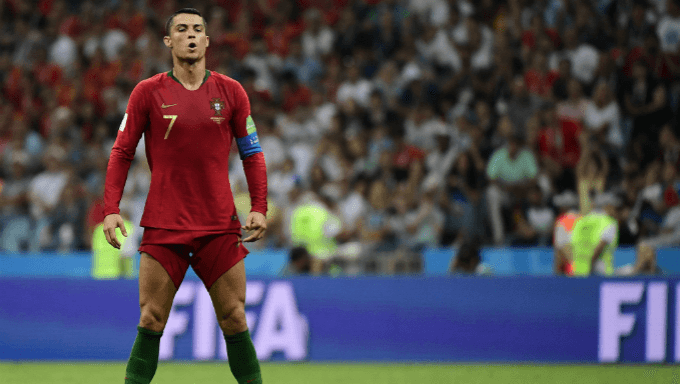 At 33 years and 103 days, the Portuguese forward became the oldest player ever to score a World Cup hat-trick, however – like a fine wine – this player just seems to keep getting better with age, as is evidenced by his consistent performances. The aforementioned book maker offers 14/1 on Ronaldo to score from a direct free-kick. That strike versus Spain was the forward’s first successful attempt from a set-piece in 45 attempts, but now the Real Madrid man has found his stride in this regard, it could well happen again when they take on the Moroccans. You can also get 3/1 on Ronaldo to score a headed goal, a great bet considering by early March 2018, the player had scored 50 with his head in La Liga, more than any other player since 2003/04. Also in that list is 2/1 for the skipper to deliver more than 0.5 assists and 4/1 to fire in from outside the box, all worthwhile considering his form in this tournament and overall ability. Portugal to Score Three Again? European champions Portugal have not lost in a major tournament during 90 minutes since their defeat against Germany at the last World Cup in the opening match. This sees their tally of unbeaten matches run to 13, spanning the last two World Cups, Euro 2016 and last summer’s Confederations Cup. With defeat never in their minds, it looks likely that Ronaldo and co. will chase a high score versus Morocco in order to try and beat Spain to top spot and therefore avoiding a potential tough clash with Uruguay should the South Americans top group A.
Bet365 offer 11/1 on a 3-0 victory for Portugal, a sound bet seeing as this side have already proven they can reach this tally against much tougher opposition, and the defence looking well-organised despite having conceded three versus their neighbours.